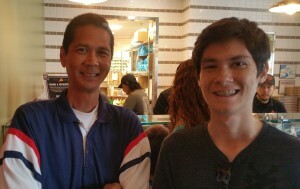 Yesterday, Josiah and Tim went to the community pool just two blocks from our house. (We are part of an HOA so our dues help pay for it.) It was the first time that anyone from our family has actually used the pool! We didn’t know what we have been missing! Our previous house had a pool in the backyard but the water in this one is even warmer (because they heat it). While we were there, Tim saw a baby lizard and took these pictures. 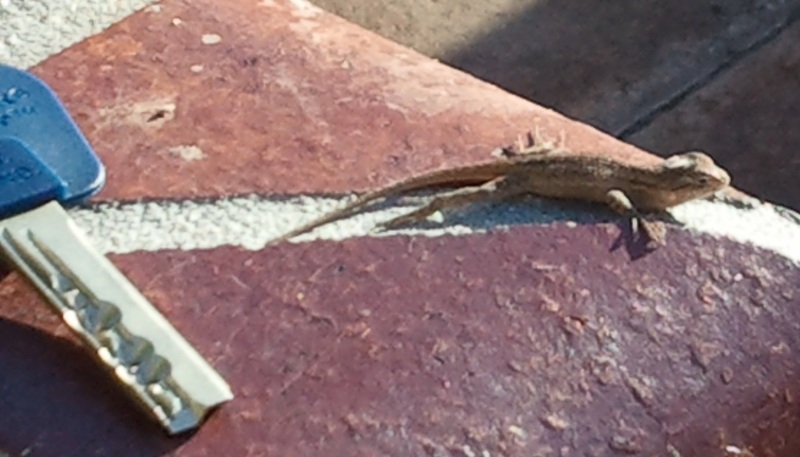 Baby Lizard near the Pool. Click photo for full size. 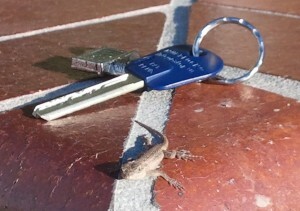 Baby Lizard. Click photo for full size. This summer, we didn’t take a family vacation like we’ve done the last three years. (In 2012, we went to Utah; 2013 to Lake Arrowhead; 2014 to Yosemite.) We couldn’t get a time that would work for everyone. Jason, Victoria, and Jeffrey went to Alaska for several weeks plus Sarah is taking a class. Also Nicole, Jason, Joanna, and Sarah are working. Then next week a number of people are going back to Iowa. 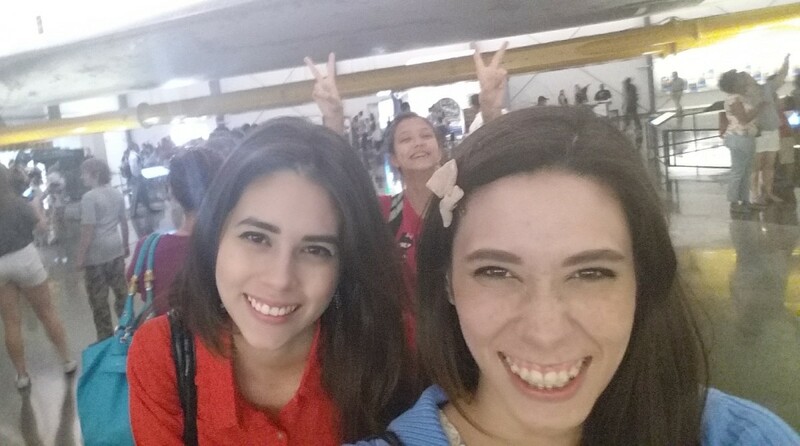 We purposely didn’t plan an early start nor did we want to pack the day with too much stuff. Tim started by cutting the grass in our front lawn. Justin, Jeffrey, and Lizzie went to church to clean it (it’s their weekly job). So by late morning, we’re starting to get ready to go. 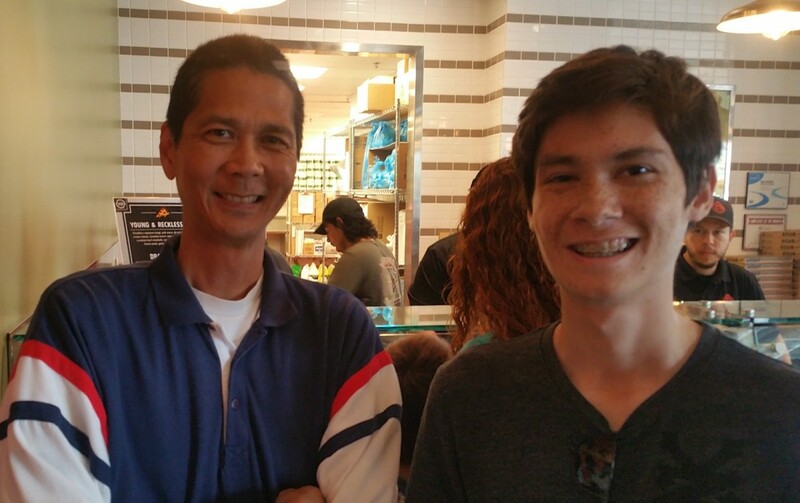 Tim and Josiah went to Bagelmania to pick up a dozen bagels and cream cheese. At home, some of the non-vegans had ham and eggs for breakfast as well. Finally a little after noon, we head out. First stop was the gas station to fill the tanks for both of our vehicles (our new Honda Civic and our Sedona minivan). Then we hopped on the northbound 405. Traffic was quite slow for many miles but, after about an hour of driving, we make it to our destination, the California Science Center. Lizzie and Joanna at the California Science Center. Click photo for full size. We had tickets to see the 3:00 PM showing of the movie, Jerusalem 3D, in the IMAX theater. 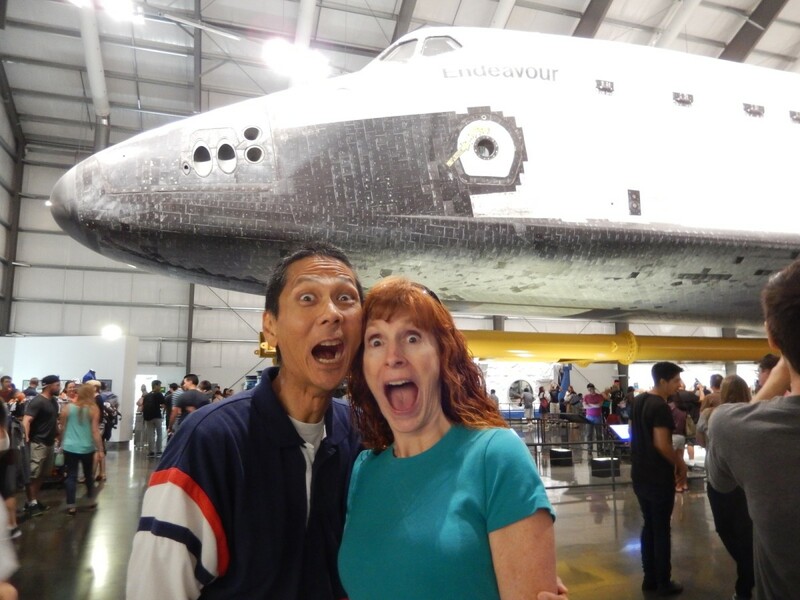 Since we didn’t want to cut short our viewing of the Space Shuttle Endeavour, we chose to check out the museum. Because it’s a science center, there are a lot of hands-on displays. 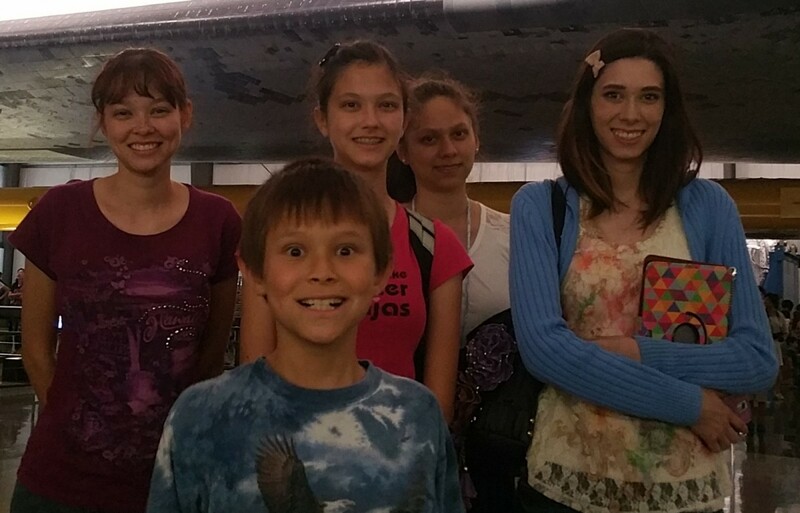 We saw things like a Mercury space capsule and learned about its heat shield. Eight of us (paid for and) rode in a motion-simulator that simulated an F-18 fighter taking off from and landing back on an aircraft carrier…plus a short rode over some surrounding hills. It was fun…but the Star Tours ride at Disneyland is better. 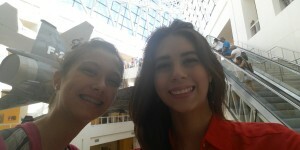 Because we had to wait for the ride, we were among the last to get in line for the movie. So with the theater fairly full, we ended up sitting in the very front row. Although looking up wasn’t ideal, it wasn’t bad. The movie featured three girls (one Muslim, one Jewish, and one Christian) each giving their personal story and thoughts on the city. We gained a better perspective about the history and current situation in Jerusalem. After the movie, we went to see the Space Shuttle. I think that everyone enjoyed seeing the Endeavour. Several years ago, some of the family saw it on the back of the Boeing 747 when it arrived in Los Angeles. Here are some photos. 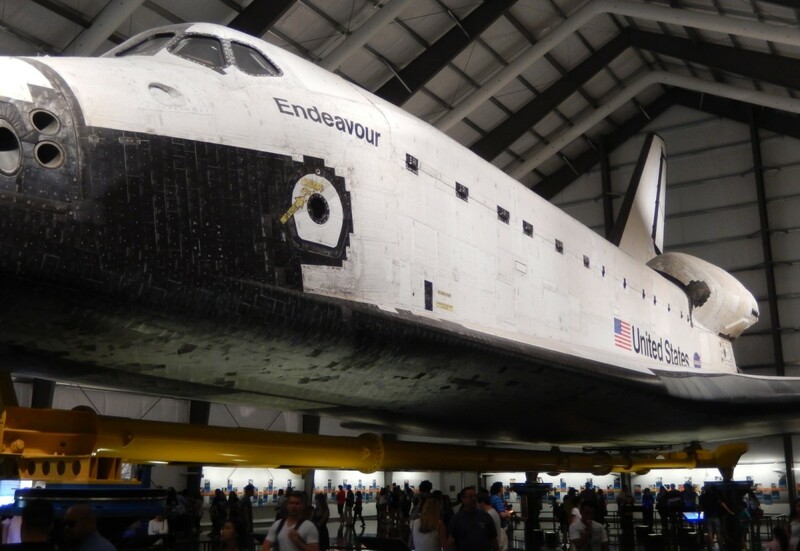 The Endeavour. Click photo for full size. 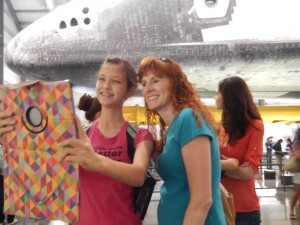 Lizzie and Jeri taking selfie in front of the Endeavour. Click photo for full size. 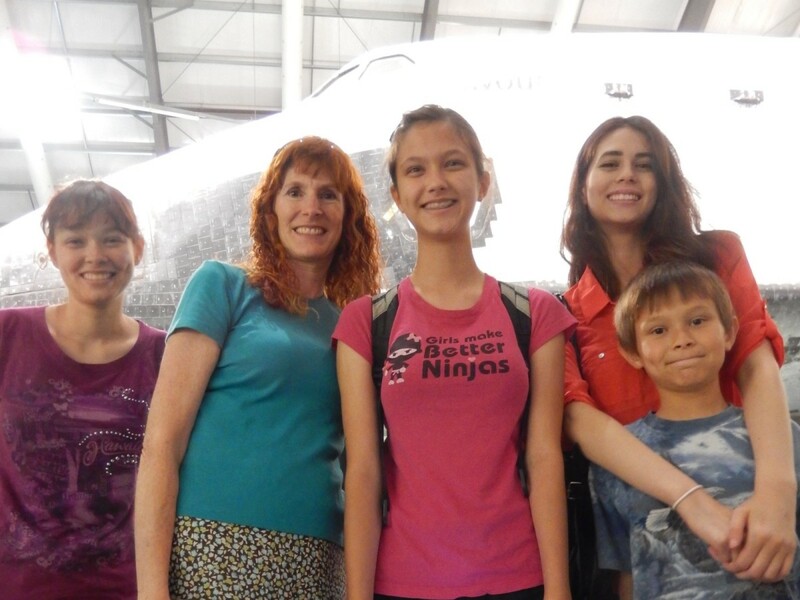 Nicole, Jeri, Lizzie, Joanna, and Josiah in front of the Endeavour. Click photo for full size. Tim and Jeri in front of the Endeavour. Click photo for full size. Joanna and Sarah (and Lizzie). Click photo for full size. 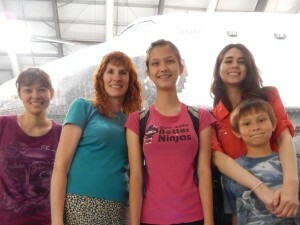 Nicole, Josiah, Lizzie, Victoria, and Sarah in front of the Endeavour. Click photo for full size. The Science Center also had a trainer of the SR-71 Blackbird. 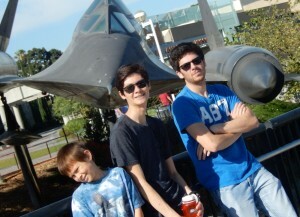 Josiah, Jeffrey and Jason in front of the SR-71 trainer. Click photo for full size. 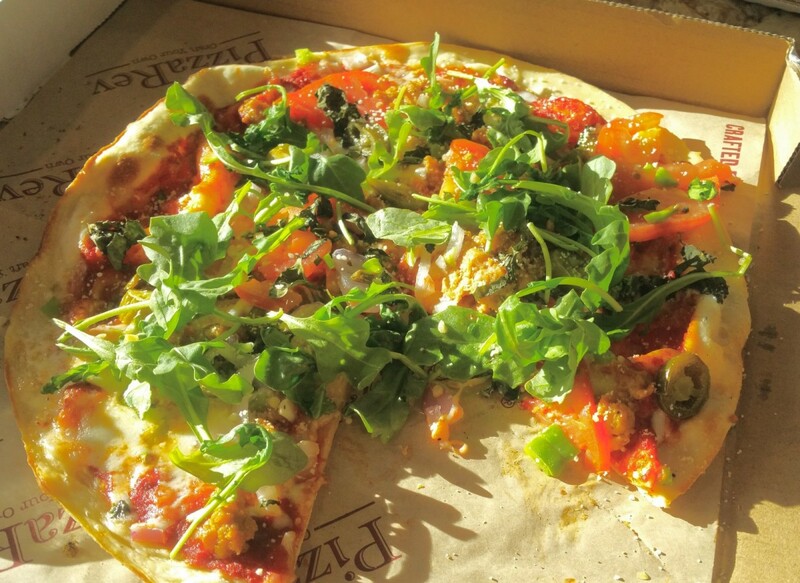 After the Science Center, we headed to Pizza Rev, a build-your-own-pizza place, in Koreatown. It was only about six miles away. However due to a road closure for a celebration at a park, we hit some slow traffic and had to detour slightly. When we parked at a parking garage, we saw a sign that said that the parking rate was $2 for every 15 minutes, up to a daily maximum of $16. Because we were hungry and we weren’t in the mood to try to find something cheaper, we parked there. Fortunately we noticed on our way out that parking was free on weekends! 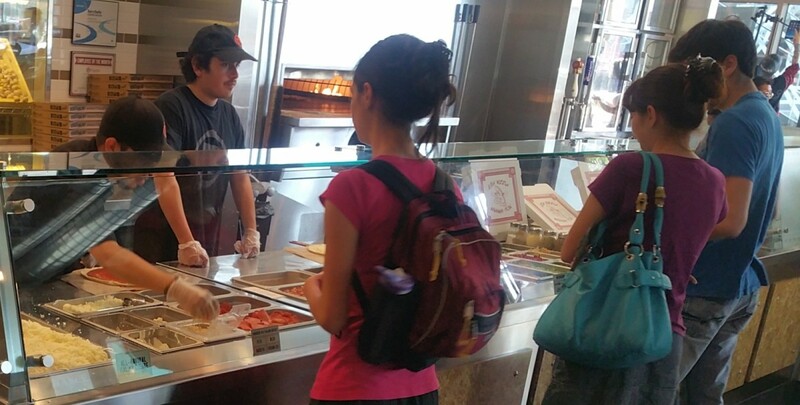 At Pizza Rev, each person could pick his or her own toppings…and add as much as they liked. Pizza Rev even had vegan cheese as an option! 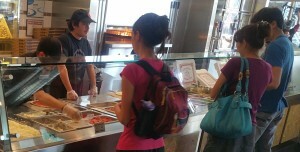 Everyone enjoyed their pizzas as well as the excellent customer service. Lizzie, Nicole, and Jason building their own pizzas. Click photo for full size. Tim and Jeffrey at Pizza Rev. Click photo for full size. A Pizza Rev pizza. Click photo for full size. By now, a few people had slight headaches, but since we were only a few miles from our final destination, Griffith Park, we knew that we would continue on. Griffith Park is home to Griffith Observatory and is a popular tourist attraction. It is situated on a hill and overlooks downtown L.A. As we began the drive up to the park, a lighted sign informed us that the parking lot at the top was full. So we decided to park in a lot below the park and hike up. We had no idea how long the hike would be. It took maybe 20 or 25 minutes and everyone made it to the top. At the park, we enjoyed some nice views of the area including the famous Hollywood sign. However due to the ever-present smog, our visibility was limited. 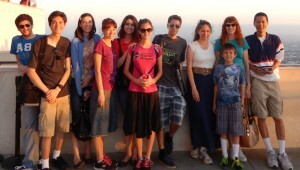 Jason, Jeffrey, Sarah, Nicole, Joanna, Lizzie, Justin, Victoria, Josiah, Jeri, and Tim at the Griffith Observatory. Click photo for full size. 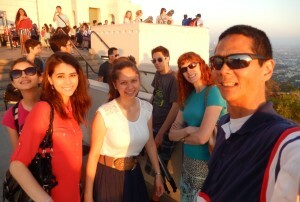 Selfie of Lizzie, Joanna, Victoria, Justin, Jeri, and Tim at the Griffith Observatory. Click photo for full size. 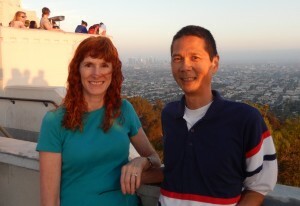 Jeri and Tim at the Griffith Observatory with downtown LA in the background. Click photo for full size. 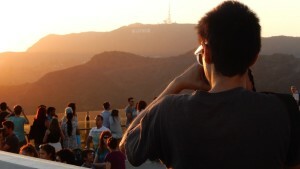 Justin taking a photo at the Griffith Observatory with the Hollywood sign in the background. Click photo for full size. After spending a little bit of time around the Observatory, we hiked back down. The trip down was, of course, easier than the one up. We left the park around sunset and got back home around 9:30 PM. It would have been sooner but there was a stalled car and a stalled bus on the 605 freeway.